The most scenic way to arrive at the Bridge Street Butchery in Waitsfield, Vermont is through the covered bridge, preferably on foot. That way, you can spy the 1833 beams and take time to gaze over the side at the Mad River below. Once on Bridge Street, you pass Peasant restaurant with its Tuscan menu, and All Things Bright and Beautiful, across the street, where Gaelic McTique crafts wooden Christmas ornaments of your pet. Then you arrive at 40 Bridge Street. The wooden sign Bridge Street Butchery hand-painted in a clear and clean font hangs over the door of the 1845 yellow clapboard building. Bells clink clink as you open the door. The owner, Jeff Lynn, 43, or his mother Suzee say hello. If you’ve been there more then once they’ll most likely greet you by name. It’s so welcoming you feel like pulling up a chair and settling in. Although this is a butcher shop, not a coffee shop, it’s a place you want to linger. “I wanted an old-world feel,” said Lynn about his store. On trips to Italy and Argentina, Lynn and his wife Tracey loved shopping daily at the old-fashioned butcher shops. He longed for fresh meat wrapped in paper not sitting on Styrofoam under plastic wrap in his town. “We didn’t have anything like that here,” he said. Here being the Mad River Valley, home to many multi-generational farms and an incubator for artisan food. Green Mountain Coffee got its start there, as did American Flatbread. Lynn’s friends tried to talk him out of starting the shop. “You always hear about butcher shops closing, it’s a flawed business model. The margins are so small and you need to be smart about pricing,” he said. But Lynn was determined, maybe even a little stubborn. He had a vision and wanted to make it happen. “I would love to see this kind of old-time business come back in full force. It’s what I want for myself. It’s what I want for my shop. It’s what I want for people who love food,” Lynn said. According to the Bureau of Labor Statistics, Lynn is part of a trend of people opening butcher shops. It could be the economy–people are eating at home more and looking for better quality. Or, maybe it’s people wanting to eat local meats. “Whatever the root cause, boutique butcher shops saw an increase in demand. There are 2500 more specialty store butchers now than there were 5 years ago. By percentage, that’s a huge difference,” said Eatocracy, CNN’s food blog. Lynn was looking for an old-world building for his old-world concept when Hurricane Irene ripped through Vermont on August 28, 2011 chewing up bridges, shredding roads, and turning communities into islands. The Mad River raged in Waitsfield and flooded the buildings on Bridge Street. There was so much destruction, that the previous tenants of the building decided not to reopen. But the owner rebuilt and Lynn saw an opportunity. 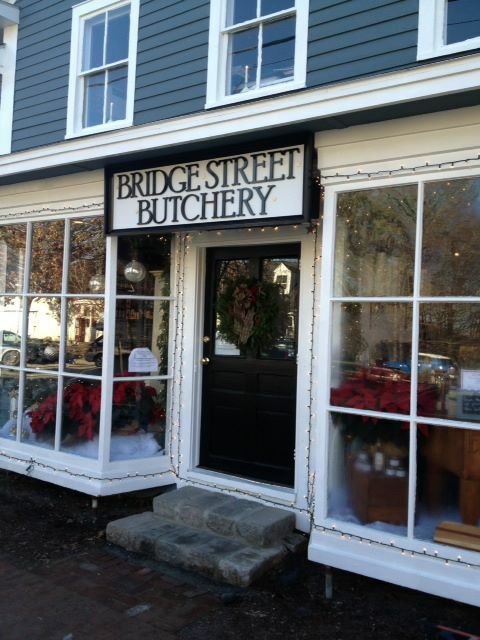 The Bridge Street Butchery opened in December 2012. In keeping with the old-world concept, Lynn doesn’t have a refrigerator or freezer. He turns over his inventory every two to three days. “Out with the old, in with the new,” he said. Lynn’s meat selection depends on slaughter dates at the local farms. Sometimes it might be whey-fed pork from Jasper Hill Farm, grass fed beef from Gaylord Farm, or Creekstone Farm Angus strip steaks. He makes his own sausages every couple of days and other specialty items like Mediterranean-stuffed pork chops. “I actually like to see the animals alive first,” said Lynn, when asked how he picks his meat. He checks to see if they’re clean, well cared for, and what their pastures are like. “Then,” he says, “the meat speaks for itself.” He’s lucky because the Mad River Valley has many farms freeing him to be picky and have high standards. Standards are something he cares deeply about. “I would rather shut the doors then compromise standards,” he said when asked what worries him most about running a small town butcher shop. Cash flow, of course, is also something that keeps him awake at night. To help with that, he diversified by adding fish to his store. Gorgeous sushi grade tuna beckons you to the fish case where you might discover Katama Bay oysters from Martha’s Vineyard or homemade sushi rolls that Lynn makes when he arrives in the morning around 5:30 or 6:00 a.m.
Fresh fish in the middle of Vermont, hundreds of miles from the ocean, doesn’t sound local. But in the Mad River Valley where locavore is a religion companies like Wood Mountain Fish, the sole purveyor of the seafood to Lynn’s shop, find inspiration. Ethan Wood, the owner of Wood Mountain Fish, goes to the Boston fish pier every morning. He scours the day boat caught fish looking for clean eyes and bright red gills. If the fish passes his inspection, and it’s something Lynn wants, he packs it on some ice in his fuel-efficient Dodge Sprinter van and drives it 200 miles north to Bridge Street and to other restaurants in the area. Lynn has been cooking since he was a kid. “Mom was on the road quite a bit so we had to pick up some skills,” he said. His parents divorced when he was young so he and his brother often made their own meals, in the Cleveland suburbs. Their father lived in the Boston area. After college, Lynn worked in restaurants in Martha’s Vineyard and Boston and ended up at the New England Culinary Institute in Montpelier. He owned the Sweet Wood Grill & Bar at Powder Hound in neighboring Warren, but was ready to try something new. This entry was posted in Business, Food, Profiles. Bookmark the permalink. Love the story, love the buthcery! Loved the reference to pulling up a chair and …Bisbee’s Hardware (when my Grampa and Dad owned it) had a central stove. Actually right in the middle of the store was a two barrel stove that was the only source of heat. That area also included three chairs. Every morning the chairs were occupied by locals to discuss almost anything. Many fond memories of the “social center” of the village. Hoping to visit next summer and will definitely be exploring the building where I grew up. Thanks for your comment! Sounds wonderful.